I have four children. I know, it’s quite the shocker. And typically the first thing that people say to me when they find out how many times I’ve reproduced is, “Oh, you must be busy”. And I am busy, most of the time. (Sometimes I’m very busy sitting on the couch reading and eating chocolate.) Now 4 kids and 1 husband do generate quite a bit of work, you know… a little bit of laundry, a few dishes and a TON of things left lying all over the floor. And for ages I was doing most of this on my own, slaving away and then getting just a tiny bit frustrated that I do everything myself. But then one day I said, “Enough is enough! It is time these children started to help!” So I started to think about motivation. I had tried to motivate them to help before, usually with charts, but I’m the queen of printing off charts and then filling them in for 2 days and then forgetting about them as the kids lose interest. But I just didn’t want to just harass them about doing chores, I like things to be fun. So I reached into my past and remembered how I loved it when my mom would write out jobs on slips of paper and put them in a jar and we could go and pull out a random job, do it and come back for another one until the jobs were done. So I created our own ‘job jar’ that we use Saturday mornings. We’ve been doing it for months and the kids still think it’s fun and it’s just become our Saturday morning routine after pancakes. The jobs are very age appropriate and can be easily done by Erik, Will and Sarah…. They really love flinging that duster around! And the whole point really is getting them doing stuff and I don’t worry too much about the end result, although I have been surprised about how great a job can do if they put their mind to it. So that’s Saturdays, but I needed motivation for them during the week that wouldn’t involve a chart. So when Sarah was at her speech therapy in January, I found this idea in a magazine and I wish I could remember what magazine or who the author was to give credit where credit is due, but I don’t remember. Sorry! But basically, you get a jar (any container would do) for each child, and as they do chores they get a marble to put in the jar. I’ve actually made a list of chores with their marble equivalent to keep things fair. 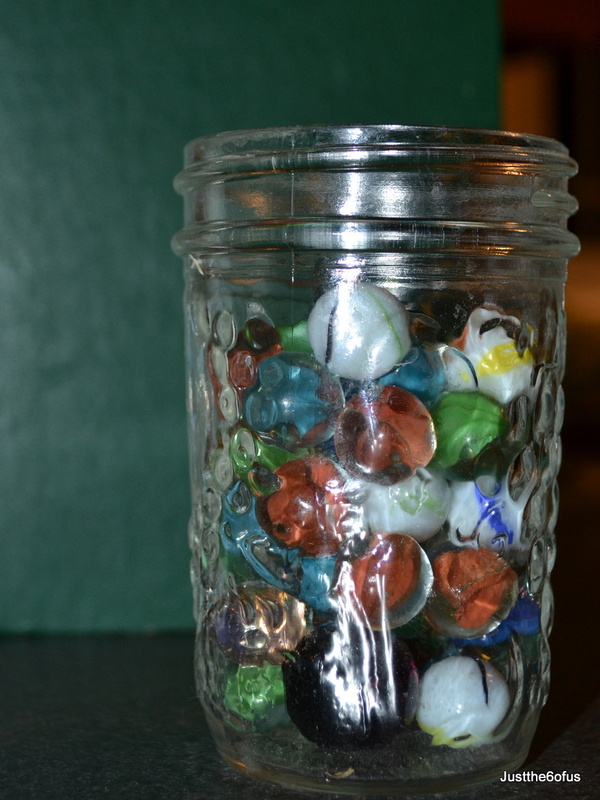 Sorry – very uninspiring jar of marbles pic, but it works. When the jar is full they either get $2 or 4 Lego bucks – which they can put towards a new Lego set and then we start over again. This should be a great marble week because the boys want to earn more money… for a good cause. The kids at our church are raising money for our sister church in Nepal and they trying to raise enough money to cover the tuition costs for 5 children and my boys are excited. And it warmed the cockles of my heart tonight to hear Erik explain how it costs $250 a year per child for tuition in Nepal and they’ve already raised $150 and so they need more money to give! They are taking this very seriously. 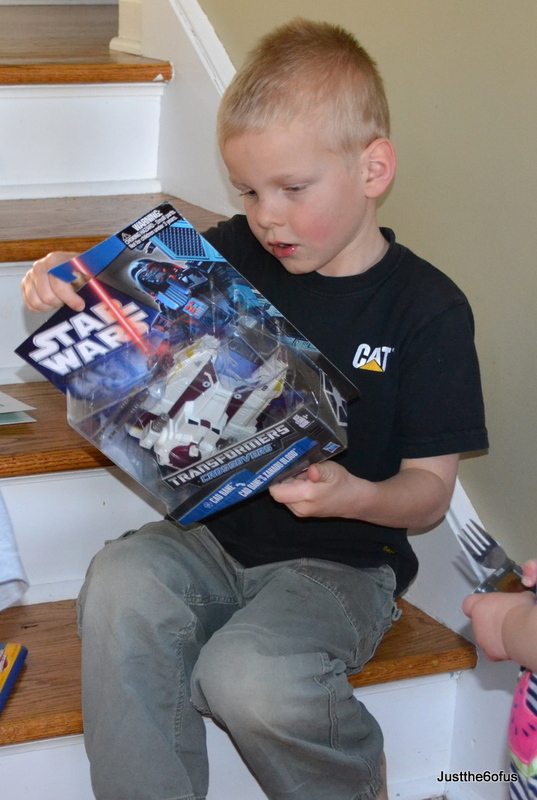 In fact, I had a hard time to restrain William this morning from emptying his piggy bank, he wanted to give it all. So I can only see this as a win-win situation. More chores equals more marbles, more marbles equals more pay-outs, more pay-outs equals more money for Nepal… how wonderful. So that’s how I share the load here and even if I am still busy, it doesn’t matter, it’s for a good cause too. 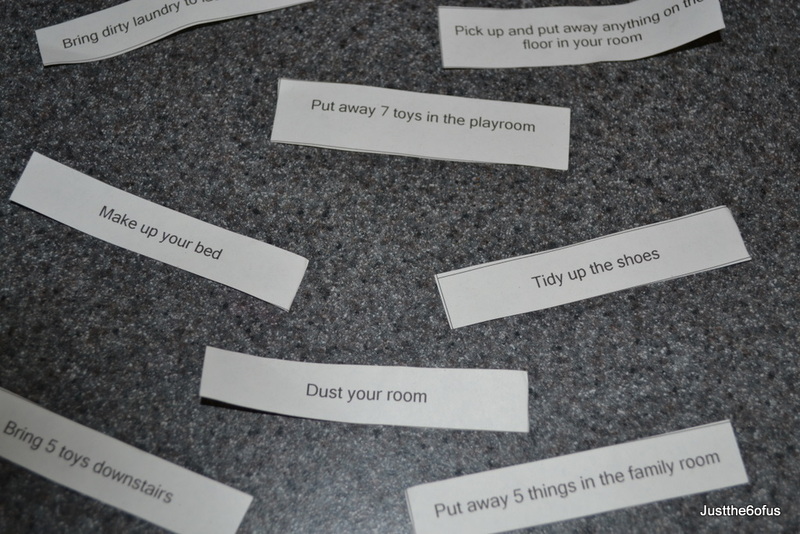 Any other thoughts on how to keep kids motivated to do chores?